The weather is still trying to make it's mind up and pretty much keeping the entirety of the UK on it's feet trying to plan out their wardrobe. I feel like this outfit is has the perfect balance when it comes to layering as well as keeping cool. Pastel blue is one of my favourite colours to wear right now. Not that it's particularly seasonal - I just think it really compliments my skin tone. I really like the cut out shoulder detailing that I have demonstrated atrociously in the photos. They're a great way of changing up a simple tee and really add to the overall effect of the outfit. ! 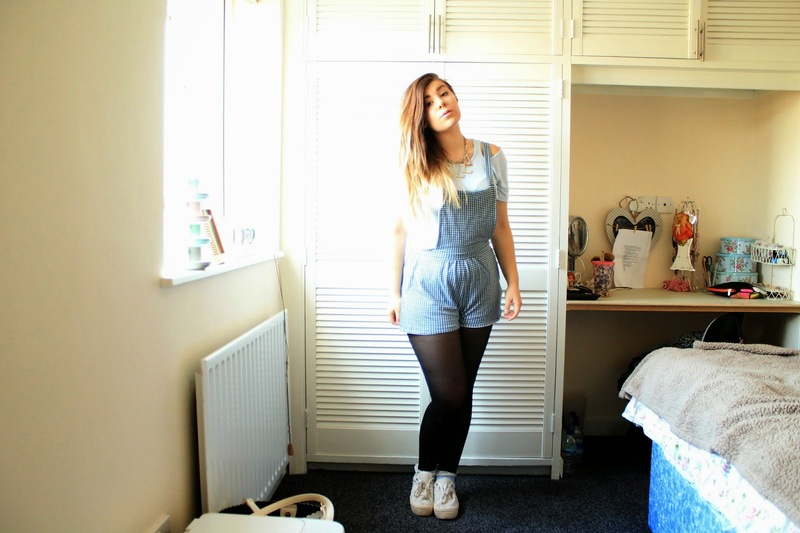 I matched this with - you guessed it, a pair of blue frilly socks from Topshop. I just can't get enough of them. My goal is to collect every colour they make. 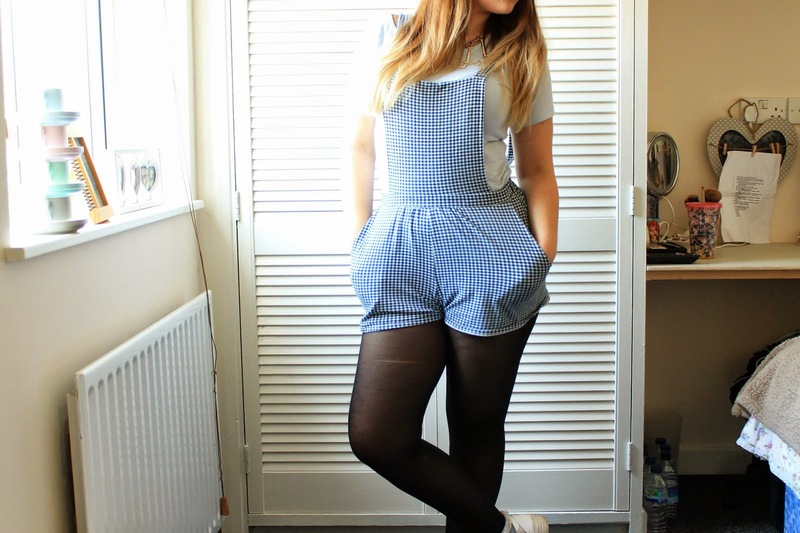 I've wanted a pair of dungaree's since I was about 10. I don't know what it is about them but I just think they're fab. Unfortunately I've never been able to find a pair that suited me - until I spied these beauties in Select. The fabric is ridiculously soft and easily maneuverable - this comes in espeicially handy when you're slightly drunk and climbing into bathtubs, not that I would know from experience. The straps are held on with an adorable button detailing that I definitely forgot to take photos of - you're just going to have to trust me on this one. Also it has pockets - which come in incredibly handy if you just need somewhere to put your phone. I adore the monochrome gingham print, I feel this gives the outfit a very kitsch appearance. The majority of my jewelry seems to have wandered off so what better way to round off the outfit than my precious 'L' necklace? I feel like the addition of this really helps to edge up the look as a whole and stops me from looking about 5. 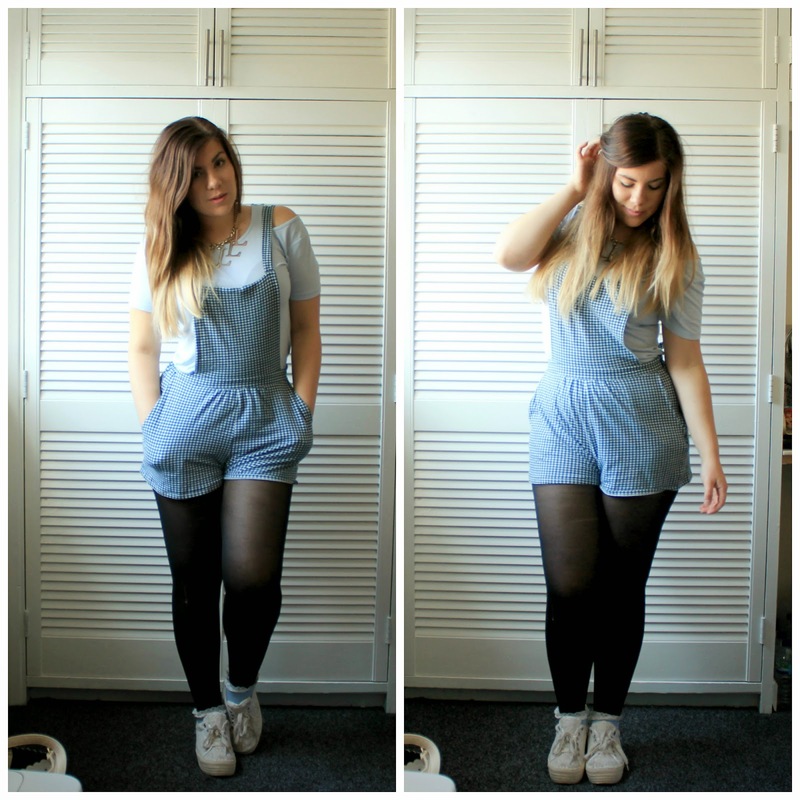 Are you a dungaree lover or loather? Let me know! PS: I'm currently in the process of a much needed revamp of my layout - Watch this space!